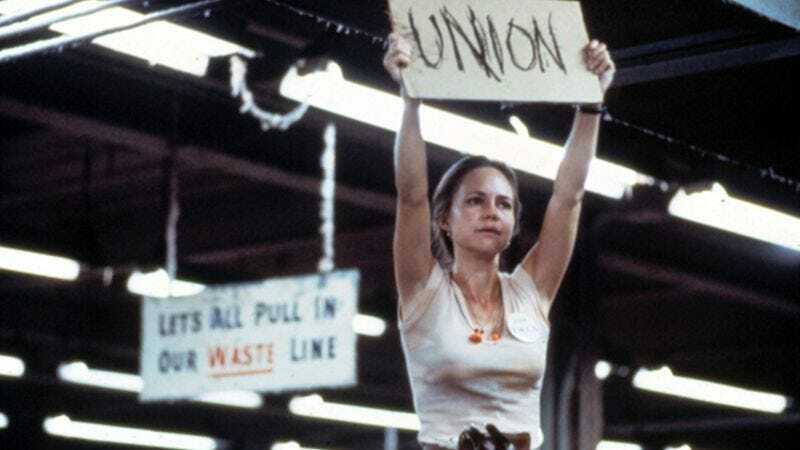 What everybody remembers about Norma Rae—probably the only thing everybody remembers about Norma Rae—is the scene where Sally Field stands up on the table in the textile mill where she works, holding a hastily scrawled cardboard sign with the word “UNION” on it above her head. It’s an uplifting scene, and the look on Field’s face as her fellow workers each shut down their machines, one by one, in a display of solidarity, embodies the essence of hope. It’s just the rest of the movie that’s soul-crushing. Norma Rae is less an activist film than a character study, as the working conditions at the mill are treated as secondary to Norma Rae’s personal struggle. There are little vignettes—a character is told to keep working even though his arm has gone numb, and Norma Rae’s mother goes deaf from the whirring textile machines in the first scene. But overall it’s taken for granted that a union is necessary, and Norma Rae’s the one to make it happen. So mostly the audience watches Norma Rae, who’s young enough to still believe in change, almost have that belief ground out of her. Almost. The ending of Norma Rae is vague, but reassures viewers that things will be okay now that our plucky Southern heroine has gained self-respect and the respect of her community. For Crystal Lee Sutton, the North Carolina mill worker whose life Norma Rae explores, that respect came later. Seven years after her impromptu 1973 protest (which, by all accounts, is re-created faithfully in the film), management at the J.P. Stevens & Company cotton mill finally approved a contract guaranteeing workers $5 an hour and basic heath and safety standards. Sutton, who spent the interim years cleaning hotels, serving fast food, and working other demeaning minimum-wage jobs, eventually went on to travel the country speaking on behalf of the Amalgamated Clothing And Textile Workers Union until her death in 2009. Availability: Norma Rae is available on DVD, which can be obtained from Netflix, Amazon, or your local video store.